United Methodists once again responded with extravagant generosity on UMC #GivingTuesday. On December 2, 2014, more than $2.5 million was donated online through The Advance to support mission and ministries around the world. The denomination’s General Board of Global Ministries matched the first $1 million in gifts to help build excitement and leverage donations. 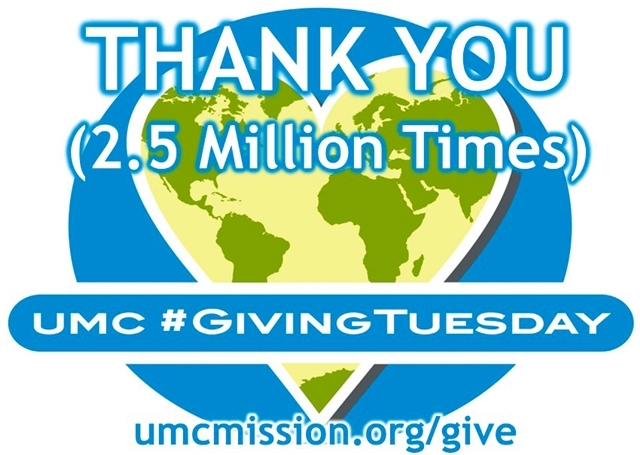 More than 770 projects and missionaries received more 8,700 gifts through UMC #GivingTuesday. The response was global with donors from 25 countries giving generously. The Advance is the designated giving channel of the United Methodist Church. While there was a cap on how much of each gift was matched by Global Ministries, so that as many organizations as possible received some of the matching funds, Knudsen said that projects were also encouraged to work with faithful donors to develop their own matches. “Many of them found unique ways to connect through their networks, building on toolkits we created for them. These messages gained momentum and were shared electronically around the world through the grassroots,” she said. This is the second year that The Advance participated in UMC #GivingTuesday, part of a larger international movement that provides an alternative to the shopping traditions following Thanksgiving—Black Friday, Local Business Saturday and Cyber Monday. According to Mashable, the number of nonprofits that received an online donation this year on #GivingTuesday increased 15 percent from 2013, while the total number of transactions was up 50 percent. Denominational agencies such as The General Board of Higher Education and Ministry, General Board of Discipleship, Commission on Religion and Race, and United Methodist Communications united to help promote giving through The Advance on UMC #GivingTuesday. Emily Miller, Global Ministries’ associate general secretary for Communications and Development, said she is thrilled about the creative ways diverse groups participated in #GivingTuesday and about how United Methodist organizations got involved. A full report of projects that were supported and the gifts that Global Ministries matched will be available at www.umcmission.org on December 15. United Methodists once again responded on UMC #GivingTuesday with extravagant generosity – donating more than $2.5 million online through The Advance to support mission and ministries around the world. More than 770 projects and missionaries received more 8,700 gifts through UMC #GivingTuesday, and the response was global with donors from 25 countries giving generously. The Advance is the designated giving channel of the United Methodist Church. The General Board of Global Ministries matched the first $1 million in gifts to help build excitement and leverage donations. A full report of projects that were supported and the gifts that Global Ministries matched will be available at umcmission.org on December 15.